Boeing and AFRL's sodium laser guide star commence operations: The Boeing and US Air Force Research Laboratory (US AFRL) built sodium laser guide star (LGS) has begun operations on a telescope at the Starfire Optical Range (SOR) of Kirtland Air Force Base in New Mexico, US. 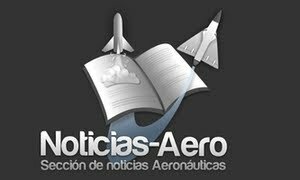 El objetivo de las pruebas ha sido el de alcanzar el mayor grado de interoperatividad entre el barco y los helicópteros y han consistido en comprobar la capacidad del ‘Juan Carlos I’ para realizar la carga, transporte y operación de estas aeronaves. Barcelona.- El pasado jueves se presentó el Centro Internacional de Formación de Controladores de Tráfico Aéreo de la UPC, con sede en la Escuela de Ingeniería de Telecomunicación y Aeroespacial de Castelldefels (EETAC). Madrid.- La Agencia Espacial Europea (ESA) ha instalado en España un radar diseñado para probar nuevas técnicas para detectar fragmentos de basura espacial que pudieran suponer un peligro para las actividades en órbita. ONR Awards Contract To Develop GPS Jamming And Spoofing Detection Technology: Taps Rockwell Collins For The Three-Year MIST Program The Office of Naval Research has awarded Rockwell Collins a contract to develop technology to locate and classify an adversary’s attempts to interfere with GPS signals and disrupt military operations. Predators, Reapers Break Flying Record: Six Reapers, Four Predators Flown Simultaneously During Training Mission The 29th Attack Squadron, 9th Attack Squadron, and the 6th Reconnaissance Squadron set a non-combat record October 2, by flying six MQ-9 Reapers and four MQ-1 Predators simultaneously during a training mission at Holloman Air Force Base, NM. SEATTLE, Oct. 16, 2012 -- Boeing [NYSE: BA] this week begins assembling the first refueling boom for the U.S. Air Force's next-generation aerial refueling tanker aircraft in the KC-46 Boom Assembly Center that opened today at Boeing Field in Seattle. "We're pleased that this facility opened on schedule," said Maureen Dougherty, KC-46 vice president and program manager for Boeing. "The KC-46A will feature a modernized fly-by-wire boom based on the proven system on the U.S. Air Force's KC-10 tanker, which will give it advanced refueling capabilities, allowing it to refuel any fixed-wing receiver aircraft anytime and on any mission." Boom assembly marks the program's shift to production from design activities. "It's a big day for the KC-46 Tanker Program and the U.S. Air Force," said Maj. Gen. John Thompson, U.S. Air Force Tanker Program Executive Officer and KC-46 Program Director. "Boeing continues to make good progress toward delivering the KC-46 Tanker on schedule." The first boom will enter testing during the third quarter of 2013 at a System Integration Lab (SIL), known as SIL 0. It is one of five labs designed to reduce risk for avionics and aerial refueling integration. Boeing invented the air refueling boom and has been building, upgrading and modifying them for more than 60 years. Boeing's KC-46 program remains on track to deliver 18 combat-ready tankers by 2017, and for the next major Air Force contract milestone, the Critical Design Review, scheduled for the summer of 2013. Production of the KC-46 aircraft begins next summer in Boeing's Everett, Wash., factory. The aircraft will be a 767-2C variant of the commercial 767-200ER airplane. Boeing will build 179 next-generation aerial refueling tanker aircraft to begin replacing the Air Force's aging KC-135 tankers. 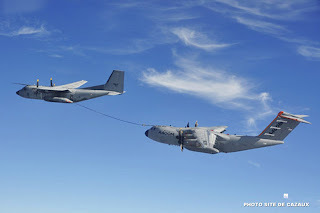 Airbus Military has successfully performed simulated air-to-air refuelling (AAR) of the new generation A400M airlifter from a C-160 Transall tanker of the French Air Force. 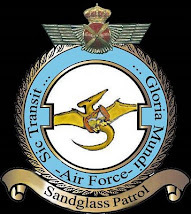 The two aircraft conducted 20 "dry contacts", in which no fuel is passed, including one lasting 12 minutes - representative of a normal refuelling operation. It is expected that "wet contacts" will take place in the first quarter of next year. The A400M has now successfully performed refuelling contacts with a VC10 of the Royal Air Force, the C-160, and an Airbus Military A330 MRTT new generation tanker/transport. The photo above shows the A400M refuelling from the C-160 in the latest trials.